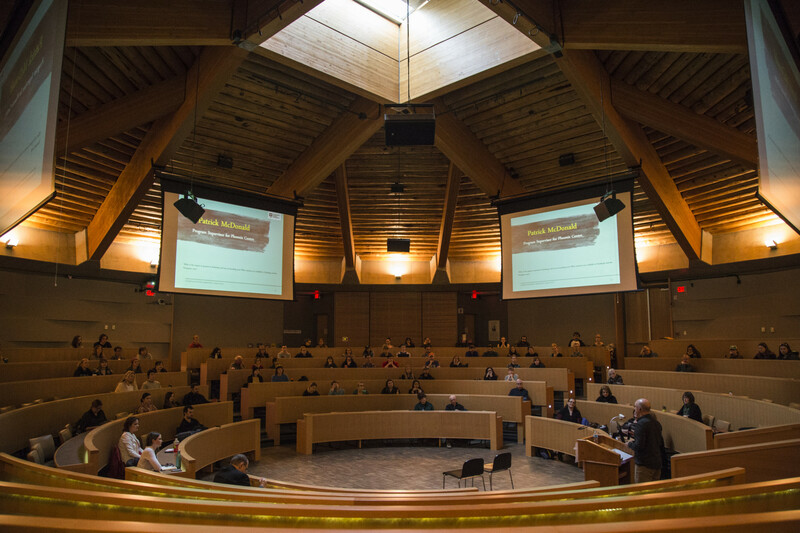 Last week, Thompson Rivers University was host to a discussion on the fentanyl crisis that is hitting all of Canada, but B.C. especially. Experts from addictions therapy clinics, Interior Health and the Phoenix Centre were in attendance in addition to family members of overdose victims. While the main focus of the event was on how to recognize, prevent and minimize future opioid overdoses, attendees also had the opportunity to learn how to use naloxone themselves. Members of the audience were also encouraged to take home one of the many free naloxone kits available. Simply having a kit on you or in your car could save a life, said Mandy Manak, the medical director of the Interior Chemical Dependency Office. “Remember that Narcan (naloxone) is a life saving measure. It won’t save your life if you are using, but it can save the life of the people around you,” Manak said. The current crisis, which turned into an epidemic in 2015, has only grown worse with the recent introduction of an even stronger opiate, carfentanil. While fentanyl is still much more common, Interior Health confirmed the presence of carfentanil in two separate tests last week. One of the positive tests stemmed from imitation oxycodone pills. Cutting street drugs with fentanyl and carfentanil is what has many addiction counsellors and physicians worried. During Thursday’s discussion, Manak claimed that nearly 80 per cent of heroin on Kamloops’ streets contains fentanyl. Yet opiates aren’t the only drugs being mixed with fentanyl. While abstinence from drug use is preferred, experts like Patrick McDonald, the Phoenix Centre’s program supervisor, know that addiction isn’t something easily escaped. McDonald, who came close to losing his nephew to fentanyl, admitted that the current crisis is like nothing he’s seen before in his years of addiction counselling. While the panelists unanimously agreed that there has never been a more dangerous time to be a drug user, Kirsten Roche, an overdose prevention nurse with Interior Health, stressed that even recreational drug users should practice harm reduction techniques. Roche also said that, although it might sound harsh, it’s safer for one person to try the drugs first, so that if an overdose does occur, the other person can offer aid. “Stigma kills and when we don’t talk about these things, that’s when trouble happens,” Roche said.